The WHOLE pregnancy, I have had a serious passion for fruit. Any fruit. So on Pinterest, when I saw a recipe for dried strawberries, I fell in love. Also, my strawberries were beginning the decent to grossness. Let's be real, when they're soft, nobody will eat them! It's like drinking milk ON the expiration date... just doesn't happen. Place on an un-greased baking sheet. Bake at 200* for 3 hours. *** BE SURE TO PROP YOUR OVEN OPEN TO LET MOISTURE OUT!! I store them in the fridge. I can't remember if I bragged told you all yet that we got new tables in our living room! We originally had a hand-me-down set from my parents, which was wonderful, but they had glass tops on them. We thought it might be questionable parenting if we had them with a child running around so we got replacements. From a furniture store. Like REAL furniture. Not the piece-together-particle-board kind. The real deal. The best part? I feel like we stole them. They were about 50% off with sales and markdowns! Worth every penny. Our coasters with the glass top tables, were also glass (which by the way are UNREASONABLY difficult to keep clean). This just wouldn't work for our new beautiful tables. So what did we do? WE MADE SOME! Becca (twin sister) just bought a home so she needed some too... perfect thing to do during a sister's overnight stay. We were not about to spend $20 a set on "nice" coasters so we thought we would improvise from something we saw on Pinterest. Plain tiles - we got 16 (4 sets of 4 coasters is the outcome) at Home Depot for 13 cents a piece. Lace - We did 1 yard of lace and used about 1/5 of it. You can never have too much. A non-pregnant person that can do the spraying for you. Cut the lace so you have 18 pieces (for 16 coasters) about the size of your tiles. Becca liked the ones that were off center and I liked the centered ones, you have options. The reason you cut two extra is because you may want to test which color should go on the bottom and which on top. You can see in the picture above by Becca's knees, there are two spots painted without tiles. This is where we discovered we like the brown on top. 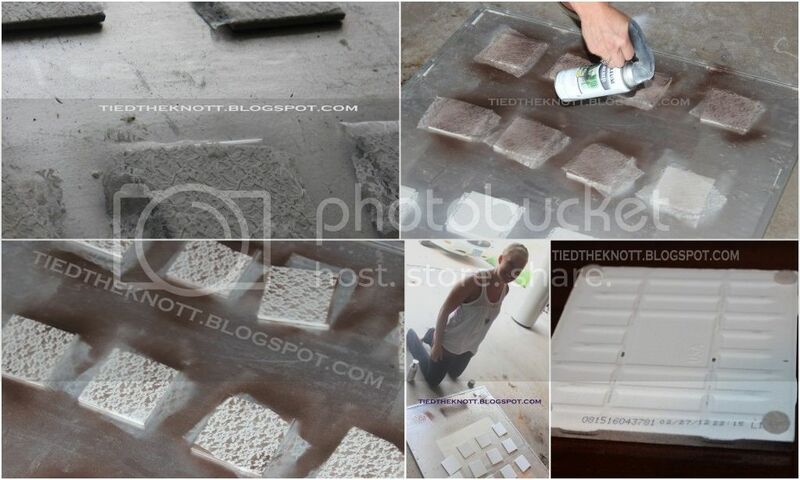 Lay out your tiles on the surface you want to paint them on. Spray on a LIGHT coat of your base color (our pearl color). The reason I say light is you don't exactly want drips. Let dry for about 1 hour. Place a piece of lace on each of the tiles, on top of your base color. Again, spray a LIGHT coat of your secondary color. Seriously guys, just a mist. If you use too much, you might not get the whole lace effect as it can creep under the lace. Let stand for 1 hour and remove lace. Place what I call "savers" which are just felt pads on the bottom of the coasters so they don't scratch your table. Then, take a picture of the awesome outcome. Easy, inexpensive, and a fun thing to do with a friend/sister (and my husband LOVES them... BONUS!). 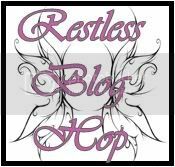 Today I am participating in the Restless Blog Hop!! Thanks for visiting, all you new and pre-existing readers!! For those who are new, you should know that every Friday, as a celebration of the weekend, I post a recipe I think you'll love. Other recipes I have posted in the past can be found here. Let me know what you think! I love LOVE potatoes/carbs/obviously healthy foods. I kid. But seriously, easy apps when you have company? There's nothing better. Also, as a disclaimer, this is just a GUIDELINE! Feel free to add things and remove things as you see fit. The recipe for the dipping sauce helps a LOT. It is amazing. You can spice up as you wish, or just use plain ol' ranch!! 2 large russet potatoes scrubbed and sliced. I used my mandolin so the pieces were all the same. 4 Tablespoons crumbled bacon (you can use slices OR the Oscar Meyer Bacon Pieces (which I used)). Place sliced potatoes in a kettle of cold water and bring to a boil, covered for 5 minutes. Carefully (so they don't fall apart) drain, and transfer slices to a paper towel on the counter top. Pat to dry. On a greased baking sheet, lay out potato slices so they are overlapping on it. Spray lightly with additional cooking spray, then sprinkle with salt & pepper. Sprinkle evenly with shredded cheese & bacon. Bake 12-14 minutes in preheated oven until cheese is melted & bubbly. 3/8 teaspoons cayenne (adjust more or less depending on how spicy you want). Place all ingredients in a small bowl, and whisk till smooth. Don't forget to read yesterday's late-night post that just could not possibly wait until a future date to share. I love it! Well, I am getting less and less enthusiastic about cooking these days. Maybe it's because I am developing an aversion to things I used to love... or maybe it's because my belly runs into the counter when I try to do anything, but THIS... this was an easy as pie prize. And as a bonus, Tyler LOVED it!! For this recipe, you will use measuring cups, grater, one bowl, and one 9x13 pan. See??? Hardly any cleanup! Perfect for when a newborn is present, no? 4 boneless skinless chicken breasts cut into strips (mine are about 1"x1"
2 bags of Simply Potatoes shredded potatoes in your refrigerated section or 5c. potatoes grated with a box grater in your own home. I used option B.
Spray 9"x13" baking dish with cooking spray. In medium bowl, stir together chicken strips and buffalo sauce. Put into baking dish in a single layer. Grate potatoes (or remove potatoes from bag). In the same bowl as above, stir together potatoes, dressing, cheese and soup. Spread over chicken. Sprinkle bread crumbs evenly over the top. Cover with foil and bake for 40 minutes; uncover and bake 20 to 25 minutes longer or until potatoes are tender and chicken is no longer pink in the center when you cut into the thickest chunk. Two things: 1. 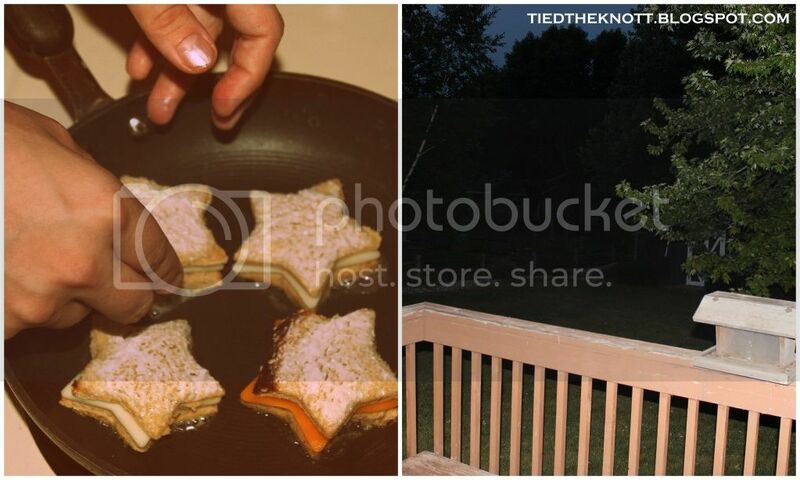 Last night we did an experiment to see what type of cheese we like best on our grilled cheese. I like muenster and Tyler liked pepper jack. It was kind of fun!! 2. Where is the sun at 7am?! I am already missing long summer days. Now, I LOVE our baby girl's room. She has her own girly space that she will grow up in, modify, love, hate, change, customize... it is her space. We still have some tweaks to make before she arrives like stuffing her daddy's bear or getting some curtains/blinds, but mostly we wait. Because I am in LOVE with many of her decorations, I thought I would share where I got some of them. Contact me if you want to know more!!! This was Tyler's when he was a little boy. We have to add a little stuffing and stitch a hole, but he is SO excited for his little girl to enjoy Mr. Bear as much as he did. This'll be short and sweet. I went to the doctor today for our first progress check and discovered we are measuring one week ahead (37 weeks), -2 station, and 1cm dilated meaning we are on our way!!! She said most people at 36 weeks are still closed! Making progress here, people! I'm guessing we'll hold our baby in 2 weeks or less. WOO! Oh my GOSH I am so excited! I put this link to Elton John's Tiny Dancer here because it fits this post/video so so SO well. I love our baby so so much. My favorite thing so far is just feeling her move. Then you know she's there. You know she is OK.
Now that she is running out of room (we have less than 5 weeks left), I can feel every movement. From a hiccup to a stretch. From a flinch to a kick. I have said throughout this pregnancy that all those people that say they "LOVE being pregnant" or they "wish they could always be pregnant" were a bunch of big fat liars. But this part? This makes it worth every sore foot, wake up, stretch mark, swollen finger, and day of morning sickness. THIS is why I could do it again. It's truly amazing. The love you can have for someone who you've never met. I am so over the moon excited to meet this little angel that's been dancing all these days and nights. She just melts my heart. **Disclaimer: I only filmed for about 20 seconds because I was holding my breath. I didn't want you to think my breathing was her moving. This is allllllll her. Don't forget to look at today's Food Friday for some E-A-S-Y freezer crock pot dinners. It's all I plan to use for Baby K's first few days. Well folks... today you get a quintuple Food Friday. And if you don't know what that means, it means 5!! Yes, 5 recipes. As I mentioned before, I need to make sure that handsome man I call my husband is well fed. And for this reason, I realized I may not be able to feed him as well as I'd like post childbirth. In fact, I can almost guarantee (from friend's helpful information) that I will be in no mood to cook right away. I looked up recipes for crockpot dinners that you bag in advance. When you want to use them, take 'em out the night before so they thaw a little, and toss them in the crockpot for an identified amount of time. Absolutely BRILLIANT! The best part? For $140.00, I prepared enough food to provide us with 30+ meals (AND LEFTOVERS!!!)! Do the math here, people... That's right around $5 per meal!!! And they all consist of primarily meat and fresh vegetables. First I labeled all of my Freezer Bags with a pen. I wrote on the bag today's date, the meal name and the instructions for the day I will make it (keeping in mind that some require something added the day of). I also notated on my bags if the dish was supposed to be served over rice or egg noodles etc..
Next, I printed all of the recipes and made my grocery list. *Please note that all "bags" are 2-4 servings* You can tweak the ingredients to increase or decrease serving sizes. 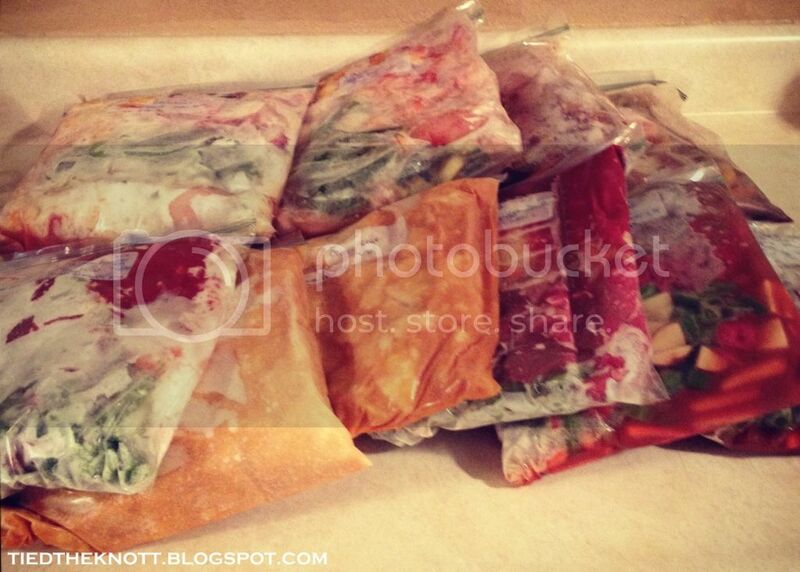 Each of my freezer bags will be dinner plus lunch the next day. Oh, and did I mention they take about 15 minutes to throw together?! I will have to keep you posted on how they TASTE as I imagine I haven't made them yet. Remember, baby hasn't arrived so I can still cook!! In a bowl, mix the orange juice, brown sugar, vinegar, salt, and ketchup. Pour the flour in a small bowl. Cover the chicken breast chunks in flour and shake off the excess. Pour a small amount of olive oil in a skillet and brown the flour-covered chicken. The chicken doesn't need to be fully cooked since it's going in the crock pot. Let chicken cool and split it between two gallon-sized freezer bags. Be sure to push the air out before closing. Store in freezer until you're ready to use. When you are ready to eat, take it out the night before and store in fridge to help thaw a little. Dump all ingredients into slow cooker and cook on low for 5-6 hours or on high for 2-3. *Add 1/4 cup teriyaki sauce to mixture. Cook on HIGH for 4 hours or LOW for 8 hours. Serve over Rice. *Place in Crockpot with 1.5 cups of water and 15 oz Beef Broth. Cook on LOW 8 Hours. Cook on HIGH for 4 hours or LOW for 8 hours. Serve over Rice or Egg Noodles. *Cook for 4 hours on HIGH or 8 hours on LOW in a slow cooker. Add (1/2) Cup of Sour Cream about 10 minutes prior to serving. Serve over Egg Noodles. Once ALL INGREDIENTS are in freezer bags push all of the air out and seal. Lay bags flat so they freeze flat. Stack in Freezer... once they are frozen you can re-arrange to best suit your freezer space. 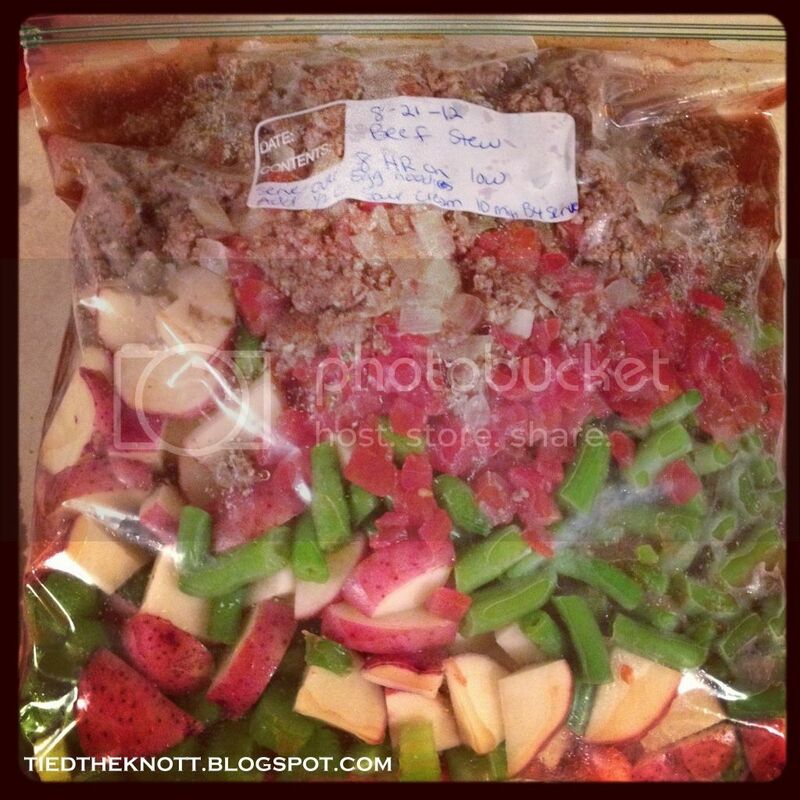 Take meal out of freezer the night before you want to put it in slow cooker so it thaws a bit.